2014 started out with one goal in mind, to hike Tour du Mont Blanc. Each year, I try to take advantage of my vacation time by doing the biggest trip I can reasonably afford to do. In 2012, I walked Camino de Santiago and backpacked Western Europe. Last year, Julia and I went to Peru and walked the Salkantay Trek to Machu Picchu, then walked the Ausangate circuit. The Ausangate circuit is still my all time favorite trip. I wanted to go back to Europe this year, and thus, began planning for Tour du Mont Blanc. To train, Julia and I did a ton of hiking in Southern California to prepare our legs to hammer out longer days. In the end, it was all for not. After two days of sunny skies, we were slammed with 7 straight days of rain! Nonetheless, we made the best of our situation and caught a flight to Eastern Europe to enjoy the remaining week of our vacation. Seeing Prague, Vienna, and Budapest made all of the wet, muddy hiking seem worthwhile. Upon returning from our vacation, we hiked Half Dome, Grand Canyon Rim to Rim, and Mt. Whitney, among many other hikes. In total, our hiking mileage this year was north of 700. My goal for 2015 is to hike more than 1000 miles. It may seem like a lot, but keep in mind I walked 500+ miles in 25 days on Camino de Santiago. As for the big trip this year…things are still undecided. John Muir Trail, Transcordillera in Bolivia, and the mountains of Bhutan all sound intriguing. We’ll have to wait and see what happens. So, without furhter ado, here are my top seven moments from 2014! Cottonwood Lakes to Mt. Langley is an incredible hike. The trail starts out level through a wooded area before dropping you off above 10,000 feet to see 5 incredible lakes. If that wasn’t reason enough to make this list, after seeing the lakes, we hiked Old Army Pass to the summit of Mt. Langley. This was our second 14,000+ft mountain of the month. I will definitley be returning to do this one again in 2015. Another major part of this year was my dog, Isla. She’s a goldendoodle that loves to hike and have fun on adventures. Last year, she was still a little too young to go on long hikes. It wasn’t until about September of this year that I felt confident in her conditioning and strength to really let her go all out. Well, now she is a bonafide mountain dog, having reached the summit of a few peaks, camped above 10,000 ft, and swashbuckled her way to a snowy summit of Mt. Baldy in November. She’s just getting started, expect to see a lot more of Isla Jade in 2015. Hiking Half Dome was the first thing Julia and I did upon returning from Tour Du Mont Blanc and Eastern Europe. The hike almost didn’t happen though, as Yosemite was dealing with a serious bout of fires. To make things even more precarious, thunder storms were expected the day of our hike. Well, for anyone who knows anything about the granite on Half Dome…it doesn’t mix well with water. In the end, we gave it a shot, and the storm never materialized. The skies were grey and smokey, but it gave the Yosemite Valley a different kind of post apocalyptic beauty. After finishing Tour du Mont Blanc, our initial plan was to continue on walking the Walker’s Haute Route to Zermatt, Switzerland. Well, after seven straight days of rain, and nothing but more rain in the forecast, we bought plane tickets to Prague and ventured off on a different sort of vacation. I’m so glad we did. I haven’t been a city tourist in a long time, and had forgotten how enjoyable it can be. Mt. 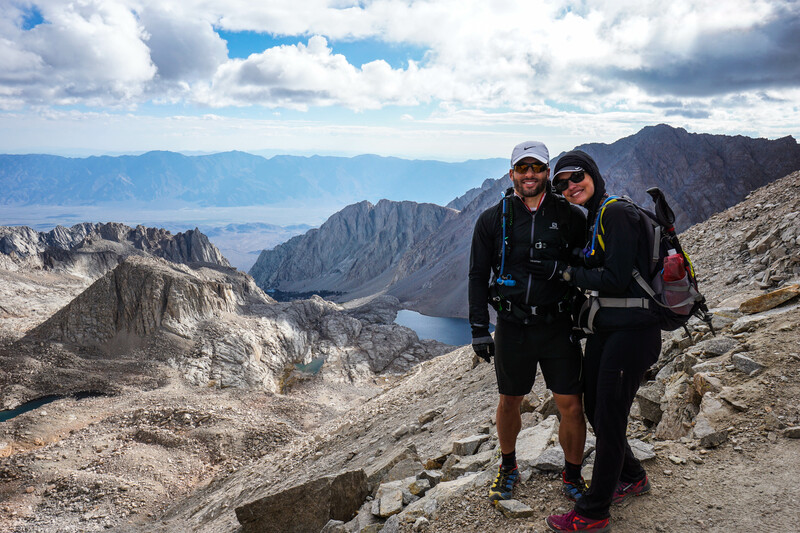 Whitney is the tallest mountain in the contiguous United States, but also one of the most accessible 14ers. The tough part is getting a permit to hike. We were lucky enough to get Half Dome permits, but when we also received permits for Mt. Whitney, we were convinced the stars were in alignment for our permit lotteries this year. Much like our other hikes in the year, the conditions were less then perfect. We got hit with rain, snow, hail, and wind on the way to the summit…but after Tour du Mont Blanc, it seemed like a pithy drizzle. In the end, it turned out to be ideal, as the water logged skies made for the perfect photography backdrop. As I’ve stated before, the weather was less than ideal for Tour du Mont Blanc this year. Still, I can’t let that take away from the overall experience. The first two days were phenomenal, and offered views that will last me a lifetime. On top of this, we got to trek though France, Italy, and Switzerland, visiting some of the most beautiful villages, and meeting the most memorable people. It’s taken me some time to reflect on this trip, as in the moment I was too blinded by disappointment to see it for what it is. My number one moment from 2014, is when we hiked the Grand Canyon from Rim to Rim in one day. Starting on the South Rim at South Kaibab Trail, and hiking the 20+ miles to the North Rim on North Kaibab Trail is something I’ll never forget. We watched the sunrise over millions of years in geologic history. The past really does come back to live in the depths of the Canyon. We also made friends with a deer while passing though Phantom Ranch. Topping things off was the majestic sunset on the North Rim. This hike could not have been any more perfect. Isla Gives the Storm Chaser 4/4 Paws! That’s the beauty of blogging, it’s so cool to grab inspiration from each other!